Gladys Aylward was humble woman who gave her entire life to serving Jesus Christ in a bold way. When God called her to China, the missionary society rejected her. She went on her own using her life savings to get there. When orphans landed on her doorstep, she took them in with no resources to care for them. When the Japanese Imperial Army invaded China and put a bounty on her head, she walked a hundred children to safety over a hundred miles away. Her faith, tenacity and bold trust in Christ should inspire us all. Gladys was born in Edmonton, London on February 24, 1902. She was the daughter of a mailman and had two younger sister and one younger brother. In her early life, there was nothing that showed her future calling. She loved play acting but wasn’t really interested in the things of God. At age 14, she left school and became a parlor maid. When Gladys was 18, she attended a revival that changed her life. The minister preached about dedicating ours lives to God through service. She responded to the altar call and felt called to serve in the mission field. Shortly after that, she read a magazine about how most of China had never heard the Gospel and decided that was where God would have her go. She saved what money she could from working as a maid and at age 26 to the China Inland Mission Center in London, but was rejected when she failed the examinations. Trusting God to provide an opportunity. Gladys continued to work and save for four more years when she heard of a 73-year-old missionary, Jeannie Lawson, who was looking for a younger woman to carry on her work. Gladys wrote to Mrs. Lawson and was accepted if she could get to China. That created another problem. Even with years of saving, Gladys didn’t have enough for ship fare to China, but she did have enough for train fare. In October 1930, she purchased a ticket on the Trans Siberian Railroad with a passport, Bible and a little over two pounds even though China and Russia were at war. She set off on a perilous, overland journey to the inland city of Yangchen, in the mountainous province of Shansi, a little south of Peking where few Europeans visited and the people didn’t trust foreigners. During the trip through Russia, a Russian conductor started yelling at everyone to get off the train because of a fierce battle ahead. Russian solders boarded and Gladys was forced off. The train left, and she had to walk 30 miles back to the nearest city on a cold, snowy night. She had almost no food and nearly froze to death. When she arrived in the city, she barely escaped being forced to become a Soviet military machine operator. When she arrived, Gladys met up with Jeannie Lawson. They opened an inn for mule drivers called the Inn of the Sixth Happiness as a way of serving the Chinese. This gave them the opportunity to share entertaining Bible stories with the locals and gave Gladys an opportunity to learn to speak Chinese. When Jeannie died, Gladys took a job as a foot inspector with the Chinese officials to keep the inn running and make ends meet. As foot inspector, she convinced local villages to stop the practice of binding young girls’ feet and had opportunities to share her faith. Throughout this time, the locals began to gain respect for the foreigner among them. During her second year in Yangchen, Gladys was summoned by the Mandarin. A riot had broken out in the men’s prison. When she arrived, the convicts were rampaging in the prison courtyard, and several of them had been killed. The soldiers were afraid to intervene. With that challenge to her faith, she walked into the courtyard and shouted: “Quiet! I cannot hear when everyone is shouting at once.” The men quieted and stopped rioting. Gladys spoke to a man chosen as spokesman about prison conditions and dressed down the prison warden for the lack of food and deplorable conditions. She suggested reforms that included allowing the prisoners to earn money to buy their own food. The warden agreed and donated old looms, and a grindstone so that the men could work grinding grain. The people began to call Gladys Aylward “Ai-weh-deh,” which means “Virtuous One.” It was her name from then on. A few months later, Gladys saw a woman begging by the road with a child covered with sores and obviously suffering severe malnutrition. The woman had kidnapped the child and was using the five year old girl as an aid to her begging. Gladys bought the child for ninepence. A year later, “Ninepence” came in with an abandoned boy in tow, saying, “I will eat less, so that he can have something.” Thus Ai-weh-deh acquired a second orphan, “Less.” Orphans began to arrive regularly at her doorstep. The Mandarin found Gladys’ religion ridiculous, but enjoyed talking to her and invited her to the palace often. In 1936, she officially became a Chinese citizen, and dressed as the people in her village. Other missionaries arrived in neighboring town a few years later, and Gladys helped the people accept them. In the spring of 1938, war came to China. Japanese planes bombed the city of Yangcheng, killing many and causing the survivors to flee into the mountains. Five days later, the Japanese Army occupied Yangcheng. The Mandarin gathered the survivors and told them to retreat into the mountains for the duration. At this point, he told Gladys that she had so impressed him that he wanted to become a Christian. The Mandarin asked Gladys’ advice about the prisoner still in the prison. The traditional policy favored beheading to keep them from escaping, but Gladys suggested a plan for relatives and friends of the convicts to post a bond guaranteeing their good behavior. Every man was eventually released on bond. As the war continued, Gladys often found herself behind Japanese lines passed on information to the armies of China, her adopted country. A friend sent her a message warning, “The Japanese are coming in full force. We are retreating. Come with us.” She refused sending a message that said, “Christians never retreat!” He sent back a copy of a Japanese handbill offering $100 each for the capture, dead or alive, of the Mandarin, a prominent merchant, and Ai-weh-deh (Gladys). She decided she had no choice but to lead the orphan children she had accumulated to the government orphanage at Sian. With the children in tow, she walked for twelve days spending some nights with friendly hosts and some nights unprotected on the mountainsides. On the twelfth day, they arrived at the Yellow River with no way to cross it. All boat traffic had stopped, and all civilian boats had been seized to keep them out of the hands of the Japanese. The children wanted to know, “Why don’t we cross?” She said, “There are no boats.” They said, “God can do anything. Ask Him to get us across.” They all knelt and prayed. Then they sang. A Chinese officer with a patrol heard the singing and rode up. He heard their story and said, “I think I can get you a boat.” They crossed, and after a few more difficulties Gladys finally delivered the children to Sian then collapsed with typhus fever. She was delirious for several days. As her health gradually improved, she started a Christian church in Sian, and worked elsewhere, including a settlement for lepers in Szechuan, near the borders of Tibet. Her health was permanently impaired by injuries received during the war, and in 1947 she returned to England for a badly needed operation. She remained in England, preaching there for 10 years. 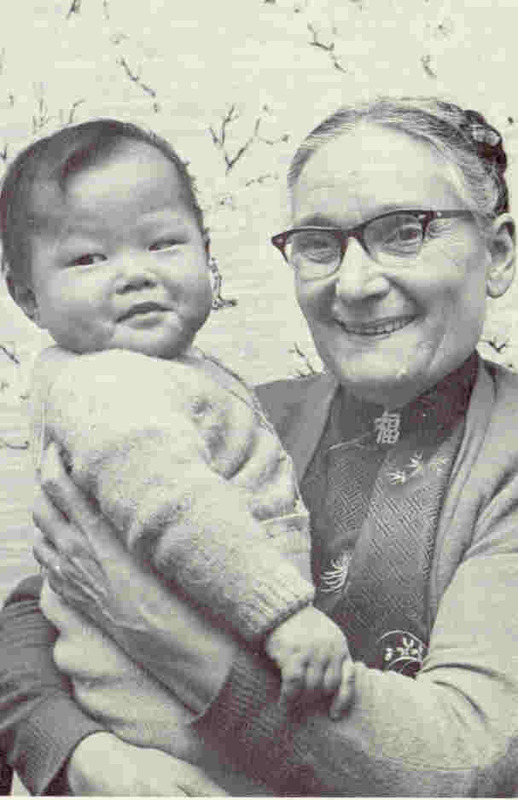 Then she traveled to Taiwan since Communist China no longer allowed missionaries to enter and started another orphanage. In 1957, Alan Burgess wrote a book about her, The Small Woman. It was condensed in The Reader’s Digest, and made into a movie called The Inn of the Sixth Happiness, starring Ingrid Bergman. When Newsweek magazine reviewed the movie, and summarized the plot, a reader, supposing the story to be fiction, wrote in to say, “In order for a movie to be good, the story should be believable!” Gladys hated the movie. She died in Taiwan on 3 January 1970. She was a hero in the faith and a bold woman who didn’t let anything stop her from doing what God called her to do. Thank you for sharing this most interesting post, Tamara Lynn. Gladys was a remarkable woman. Wow, what an amazing story. She was a true hero, indeed. Thanks so much for sharing. She really was a hero, Debbie. I'm grateful that there are people like Gladys who aren't afraid to stand up for their faith and trust God in all ways. I can't imagine how many lives she affected. I've watched the movie several times and liked it. Gladys wasn't happy with the movie. She felt her life wasn't that glamorous. I think it's amazing what God did through her.